Hello everyone and a big welcome to my blog's newest followers! I hope everyone had a good week! Mine was a little rough, but looking up now. I'm a little behind on crafting and blogging as a result, so sorry if I haven't been around for a visit. I'm hoping to catch up with everyone on the weekend. A new Playing in Paradise challenge begins today and this will be the last of our weekly challenges. Starting on the second Friday in May, we will be having monthly sketch challenges instead. I hope you will join us for those. 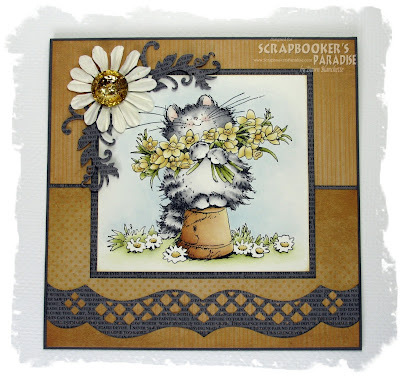 For this last weekly challenge, the talented Linda is hosting and she has chosen Springtime Joy for the theme. 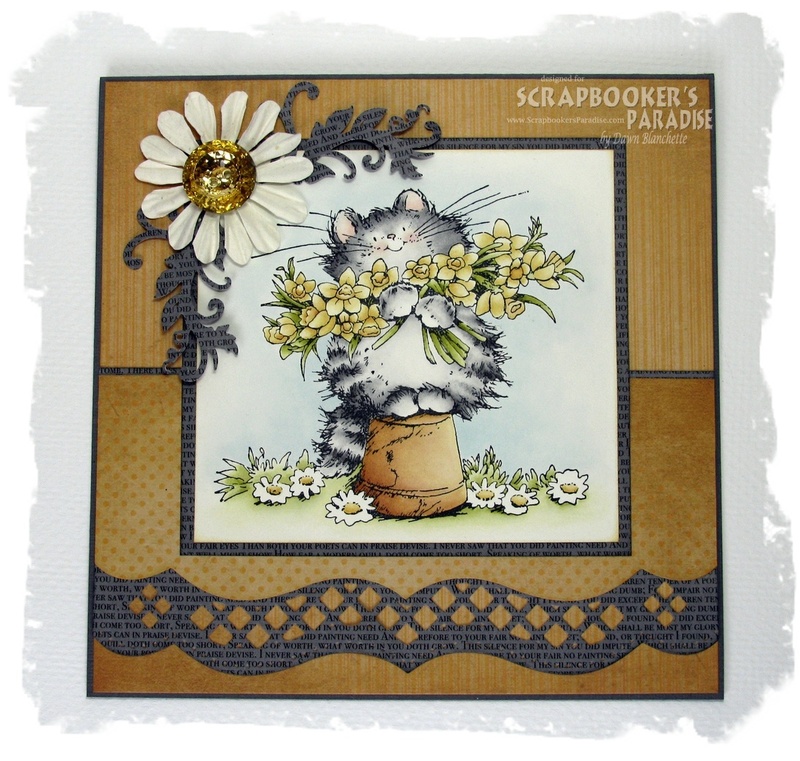 When I think of Spring, mud and snow mold allergies always come to mind but those don't make for a pretty card :o) so I went with my second thoughts of flowers and yellow (think dandelions). Stamp - Penny Black stamped on 300g hot pressed watercolour paper with black Stazon and coloured with Distress inks (scattered straw, black soot, tattered rose, stormy sky, tumbled glass, vintage photo, rusty hinge, barn door and peeled paint). The colouring looks a little washed out in the photo - it is darker IRL. The team has made some beautiful projects to inspire you, so I hope you will pop by the Playing in Paradise challenge and check them out. As always there is a wonderful prize up for grabs, so I hope you will join in the fun. I'm looking forward to seeing what you create! Such a gorgeous card Dawn. One of my favourite kitty images and coloured so beautifully. I love the papers and layout with that wonderful die cut border. Cute card work. Yellow does speak of the sunshine to come. Keep smiling and creating. Sorry you had a rough week Dawn. You've managed to create the sweetest little spring card in spite of it. (I don't know how you can pick any favorite stamps ... you have so many CUTE ones!!) I love the big armful of daffodils. I'm in Victoria right now on holidays with my husband, and I was amazed to see the daffs growing wild in the ditches. What a wonderful sight for this spring starved prairie girl! :) Hope you have a better week! it is gorgeous! I would never have thought of combining the two colors. the coloring is fabulous. Those beginning weeks of spring are icky - mud & snow mold allergies exactly! Now that the sun is peeking out a little bit it's helping me feel a lot better about the red patches under my nose ;) Here's hoping your week picks up! I love that sweet little kitty - and that stunning sparkly button! That's lovely Dawn. Fab card. Adorable card Dawn, that image is so cute. I love the papers and colours you used. Super sweet image and your water coloring is amazing! Awesome papers and design too!